Posted by pietrya on Friday, January 18, 2019 in Uncategorized. 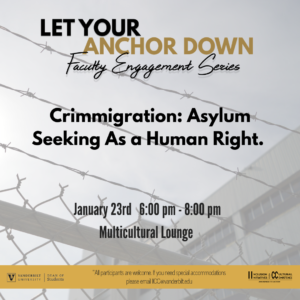 Every month throughout the academic year, the Office of Inclusion Initiatives & Cultural Competence (IICC) hosts the “Let Your Anchor Down” Faculty Engagement Series. This series encourages community building and understanding among students, staff, and faculty. This month’s topic is crimmigration – the intersection of criminal law and immigration law. Come for food, discussion, and the sharing of ideas. For questions for request for accommodation, please email IICC@vanderbilt.edu.